Unemployment is at 9% or so and the media bemoans financial apocalypse. A few years ago, unemployment was at 5% or 6% and everyone talked about prosperity. I don’t seem to remember having mountains of money then, and I certainly don’t have mountains of money now. Yes, some people have lost their jobs in the last few years, but for most Americans, 2006 wasn’t a period where we had fistfuls of money to throw into the air. The median income level then was largely the same as it is now. Emerson hits a home run here (as he often does – he’s one of my favorite writers of all time). For me, one of the surest signs of the wonderful arrival of spring is the presence of tulip bulbs at local gardening stores. 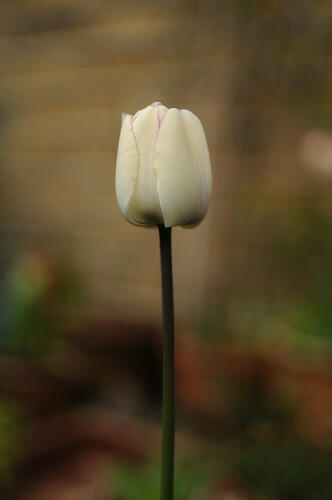 The sight of a tulip makes me ready for the steadily-growing warmth of spring. One particular highlight of spring for my family is a trip to Pella, Iowa, for their Tulip Time festival, which usually occurs on the first weekend of May (or so). I’m ready. Every big goal you set in life seems absurd when you start out. The Simple Dollar seemed absurd when I started it. At best, the whole thing was a lark, an excuse to talk to my friends indirectly about personal finance. Every big thing worth doing in life seems absurd at the beginning. I’m a weather fanatic. I’m constantly studying forecasts from lots of sources, trying to use those forecasts to plan when we’re going to take family excursions, when I’m going to plant the garden, and so forth. Weatherspark (at http://weatherspark.com/) is just amazing. It’s a tool that basically merges weather data and forecast data for your location from a bunch of different sources and shows them to you all at once. When you first look at it, it’s information overload. Start playing with it and studying it, though, and it will quickly become an indispensable tool. Oscar Peterson is one of the greatest jazz pianists of all time. His solos are stunning. Here’s a particularly amazing one. It sounds, to my ears, like this is a piano trio, not just one person. The skill and artistry on display here is stunning, even if you’re not a fan of jazz piano. If you liked this, be sure to check out the Oscar Peterson mix on YouTube. I find that, over and over again, I’m rewarded by working hard for something. I am very rarely rewarded by taking the easy path to something. Edison states this so well. It’s quotes like this that convince me to spend more time and effort looking for great ideas, great answers, and better ways to express them. This is a great short speech on motivation from the 2009 TED Talks. Motivation is a key part of moving yourself towards doing something amazing. Pink presents the ideas in an entertaining and enjoyable way. Dealing with PR people is simply part of my life. Simply because I’m a fairly high-profile blogger, I get MOUNTAINS of emails from PR people who want to tell me about the product they’re representing, some person they’re representing, or something like that. I’ve complained on Twitter quite often about PR people who are, well, annoying. They send me these horribly impersonal emails that are full of marketing-speak and feel about as cold as an icebox. These emails sometimes match something that might be of interest to me – at other times, they’re completely useless to me. Whenever I attempt to interact with one because they mention something of interest to me, they respond with something that sounds like it was written by a robot. It’s awful and off-putting, and more than once it’s convinced me to not bother to look at a potentially interesting service or book or something like that. Because of that, I really want to highlight someone who does it right – Laura Czaja at FT Press. She’s a PR person, obviously, but she does her job in a way that actually causes me to pay attention to her emails. For one, she’s really selective in what she sends me because she actually has a clue who I am and what I’m doing. At the very least, she’s bothered to take note of The Simple Dollar with enough detail to know about things that might actually match and things that won’t. For another, her emails aren’t impersonal. They’re friendly and polite and to the point in language that doesn’t sound like a machine. Brief and friendly are what works for someone like me – I want the point in a sentence or two, and she gives me that without sounding like a machine. When I reply to her, I either get a clear response or, magically, what I request just happens. Laura, you are a shining example of how the PR industry can actually work by being selective and being human, and because of that, you’re one of the very few people I pay attention to from the PR industry. PR firms, you’d do yourself a great favor by having Laura on your staff. Laura’s employers, you need to give her a raise. People who do their jobs well are always an inspiration. I wrote about Jump for Joel a few years ago, but every time I have an interaction with someone involved with J4J, I’m thoroughly impressed. Jump for Joel‘s mission is to directly improve the baseline living conditions and educational opportunities for impoverished children in sub-saharan Africa, particularly in orphanage situations. They do this through directly sponsoring volunteers to travel to that region in Africa, as well as directly buying supplies for children in such situations (school supplies, toilets, etc.). I absolutely love their Tumblr blog, outlining what volunteers are actually doing while they’re working in the field for Jump for Joel. It’s the humanity of the whole thing that comes shining through. This is another TED talk I enjoyed this week. Barry Schwartz talks about the challenges that the overflow of choices has added to our lives. I think he’s on to something here. When there are 175 choices of salad dressing at a grocery store, it becomes much more difficult to make a great choice about them. Great food for thought, thoughtfully presented.